UPDATE: Since this article was publicised, Lady Gaga’s publicist has come out and denied these reports. But still, it was fun while it lasted! No, really. Lady Gaga is actually set to play Cilla Black in a new biopic. The ‘Born This Way’ singer will be taking on the guise of the late, Liverpudlian treasure in a new biopic called Dionne – based on the life and career of Dionne Warwick. 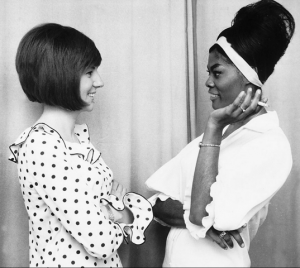 In reality, Cilla and Dionne were “musical nemeses” after Warwick accused Black of stealing her music, following the release of Black’s chart-topping cover of ‘Anyone Who Had A Heart’. In the biopic, Warwick will be played by former Destiny’s Child star LeToya Tuckett, while Danny Glover will appear as Warwick’s father, Mansel. Though Gaga may be an award-winning actress after nabbing a Golden Globe for her performance in American Horror Story: Hotel, quite how she’ll tackle Cilla’s iconic Liverpudlian accent is anyone’s guess. The film is currently being shopped for buyers in Cannes. Remind yourself of the cover that fuelled the divas’ feud below. Editor [2016 - 2017], News Editor [2015 - 2016]. Current record holder for most ever articles written by a single Edgeling. Also Film & English Student and TV Editor for The National Student. Main loves include cats, actors and pasta.